UNIVERSITY PARK — Nick Lee was a freshman just three weeks into his career as a Penn State starter last season when he got his first taste of the Penn State-Ohio State rivalry. That night made an impression on him. Even without an injured Jason Nolf, No. 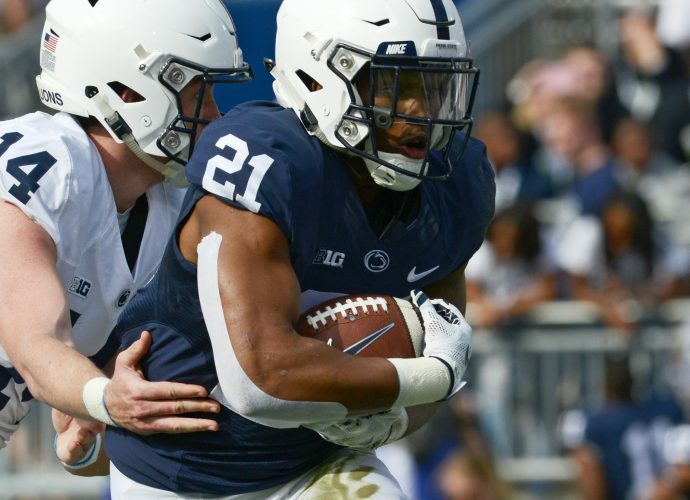 1 Penn State rallied for an epic 19-18 win over No. 2 Ohio State, thrilling 6,699 delirious Nittany Lion fans. Over the last few years, you could make an argument that Nittany Lions vs. Buckeyes on the wrestling mat has produced more memorable moments than any other two teams. Whether it was individual matchups, like Bo Nickal vs. Myles Martin, or team battles, like last year’s Rec Hall dual or the team race at the 2018 NCAA Championships, wrestling fans would be hard pressed to list a better rivalry. The latest installment will be televised live by Big Ten Network at 8:30 p.m. Friday from St. John Arena in Columbus, Ohio. The atmosphere in St. John, which seats more than 13,000 fans, promises to be electric. Coach Cael Sanderson said a raucous crowd adds another level of enjoyment to a dual meet. The Nittany Lions had to overcome the absence of two starters — 133-pounder Roman Bravo-Young and 149-pounder Brady Berge — in last Friday’s win over No. 4 Michigan. And starting 184-pounder Shakur Rasheed looked a bit sluggish in a 5-3 win wrestling with a wrap on his right knee after missing the previous three duals. Several of Friday’s bouts could be back-and-forth affairs, but two stand out. Lee will face a rematch with second-ranked 141-pounder Joey McKenna, who used a riding-time point to win a 7-6 decision a year ago. The marquee matchup will come in the dual meet’s penultimate bout between a pair of undefeated wrestlers. Top-ranked Nickal will face No. 2 Kollin Moore at 197. “I haven’t really watched too much film or thought about that a lot. I’ll probably watch some film the next couple of days. We’ll see. I’m excited to get out there and compete,” Nickal said. As for the overall matchup, each team lost key contributors from last year’s team, but the final margin could once again be razor thin. “They feel pretty good about their chances and we feel pretty good about our chances and it’s just a matter of who goes out there and gets it done on Friday,” Sanderson said.